Though the restaurant has been open a number of years at its present location on Southcenter Parkway, I hadn’t heard of it until a press release arrived via email inviting Seattle-area food and entertainment bloggers to sample the restaurant’s new small plates and snacks menu, as well as “skinny drinks” offerings. How could I resist? Bahama Breeze is housed in a sprawling building surrounded by palms (yes, certain varieties thrive in cool, damp Seattle). With its white-washed tropical architecture and eye-popping neon, it looks like a Disneyesque replica of an elegant old home on a Caribbean plantation. Caribbean food is a culinary melting pot of cuisines associated with the original Carib and Arawak Indians; Spanish, British, French and Dutch settlers; Africans, who had a pronounced influence on the food and culture of the islands; and later, Indian and Chinese settlers and U.S. travelers. A popular style of cooking native to Jamaica features meat that is dry-rubbed or marinated with a hot seasoning called Jamaican jerk spice, made with allspice and Scotch bonnet peppers (hot enough to make the eyes water), as well cinnamon, cloves, nutmeg, thyme, scallions, garlic and salt. Click here to read more about jerk cooking. As part of a small group gathered at tables around a cozy gas fire pit off the spacious bar, I tried such items as Chicken Empanadas ($4.49), featuring a filling of adobo-seasoned chicken, mushrooms, sweet pepper and onions served with black bean-roasted, corn-tomato salsa and seasoned sour cream; and Mojo-marinated Pork and Sweet Plantains ($6.99), made with tender, shredded, slow-roasted pork served over sweet plantains, with the above corn-tomato salsa and a slightly smoky guava barbecue sauce. Both were notable, but the latter was exceptional. Nearly a dozen small plates are offered, and each portion is generous. Other offerings include Sweet Peruvian Corn Cakes ($3.99) and Citrus Shrimp Cocktail ($6.99). Nearly 20 appetizers are served, from West Indies Beef Patties ($7.49) to Jamaican Grilled Wings ($5.59). I tried the Fire-roasted Jerk Shrimp ($9.99), featuring spicy shrimp served with garlic-thyme butter and fluffy Cuban bread for dipping in the savory sauce. Bahama Breeze takes its cocktail menu very seriously, with several signature concoctions as spicy and flavorful as the menu items. Among those I sampled were the Mojito Cubano ($6.29), with Bacardi Superior Rum, crushed spearmint and fresh limes; and the Painkiller ($7.29), a Virgin Islands favorite made with Pusser’s Dark Rum, Cream of Coconut, pineapple and orange juice, garnished with ground nutmeg. The original Painkiller originated at the Soggy Dollar Bar on the tiny island of Jost Van Dyke in the British Virgin Islands. 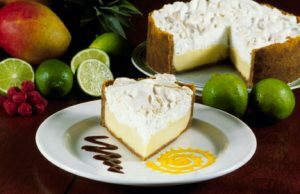 For dessert, it was impossible to resist Rebecca’s Key Lime Pie, a wonderfully dense and mildly sweet confection with meringue and thick graham cracker crust. If you find it as heavenly as I did, you can take home a whole pie. Providing the entertainment during my visit was singer, guitarist and keyboardist Big Al Miller, who played an appropriately atmospheric selection of Jimmy Buffett, classic-rock and R&B tunes. Biff Moss is another featured entertainer. 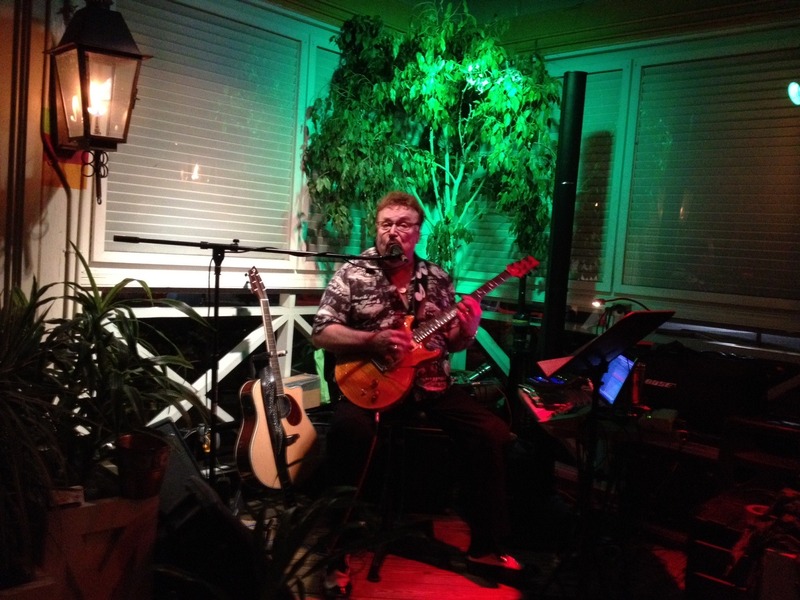 Live music is offered in the bar on Friday and Saturday nights. 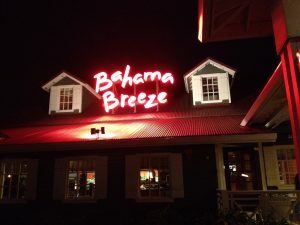 The Florida-based Bahama Breeze chain boasts nearly 30 locations nationwide, each featuring such popular entrees as Jerk Chicken Pasta, Pan-seared Salmon Pasta, Baby Back Ribs and Center-cut Filet Mignon, as well as a daily fresh fish selections. Big restaurant chains often get knocked for replicating the same dining experience ad nauseum throughout the country. 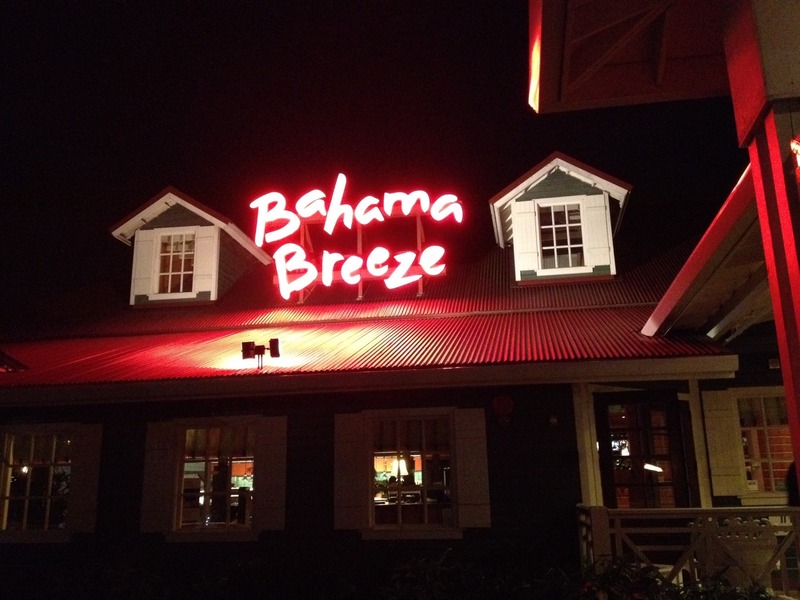 But on a chilly Seattle night, Bahama Breeze is like a tropical paradise, with Caribbean-inspired food and drink to warm the soul. For menu, hours, live music schedule and other information about the Tukwila location, follow this link.